Pro Shop at Llandrindod Wells Golf Club01597 822247workShop - SportsLlandrindod Wells Golf Club haa a well stocked pro shop with top brands such as Ping, Cobra, Wilson Staff, Nike, Orka and Titleist in stock. The Pro Shop is also a recommended fitting centre for Orka Golf and offer professional golf tuition. 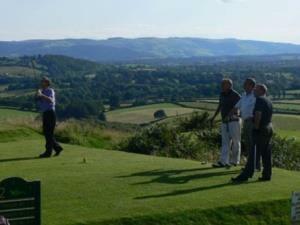 Golf tuition is available from Teaching Professional Phil Davies. Phil has built up an excellent reputation for improving peoples games, through,in particular, the successful junior academy which he runs every Wednesday evening. He bases his teachings on almost 30 years of experience in the game. Llandrindod Wells Golf Club haa a well stocked pro shop with top brands such as Ping, Cobra, Wilson Staff, Nike, Orka and Titleist in stock. The Pro Shop is also a recommended fitting centre for Orka Golf and offer professional golf tuition. Phil is a qualified European Golf Teachers Federation teacher, and also a qualified Sports Psychologist.